Given Trump's rhetoric about immigrants and his border policies, you'd think Hispanics would be leading a march to the polls. They aren't. HOUSTON — Donald Trump stares at Mary Moreno every day from across her office at the Texas Organizing Project, a group working to turn out black and Latino voters in a state ranked almost dead last in voter participation. Even with phenom Senate candidate Beto O’Rourke at the top of the Texas ticket, it hasn't been easy, as Democratic officials, party operatives and tied-in organizations in this state and across the country are seeing signs — surprising to some — that many Hispanics may sit out the midterms. The lack of enthusiasm among Latinos has party leaders concerned that a key part of the coalition needed to take back the House and Senate may stay home. "People are angry, but it doesn't necessarily make them want to vote," said Moreno. "They're like, Why even bother voting if people like Trump are going to win?" "There's a mountain of evidence showing Latino voters are a weak point for Democrats this cycle," said David Wasserman, House editor for The Cook Political Report and an NBC News contributor/senior analyst with the NBC Election Unit. More than three years after Trump launched his presidential campaign by railing against Mexican "rapists" streaming over the border, Democratic hopes and Republican fears that the growing population of Latinos would give Democrats a permanent advantage have yet to materialize. But nowhere is the Latino challenge this year more evident than Texas. O'Rourke, who is of Irish descent but adopted a Hispanic nickname, needs strong backing from Latinos to win against Cruz in the heavily Republican state. Cruz, whose father was born in Cuba, is earning the support of almost four-in-10 Latino voters, according to a Quinnipiac poll. "The problem with Texas for Democrats is not that it's a red state, it's that it's a non-voting state," Julian Castro, the former Housing and Urban Development Secretary and ex-mayor of San Antonio, told NBC News. "The issue we have is with ourselves — it's getting more people registered to vote, it's getting the Hispanic community to turn out and vote." "The more noise there is in Washington, D.C., oftentimes it can be confusing and it can be intimidating to voters," said Dan Sena, who is overseeing an estimated $30 million outreach effort to young and minority voters as executive director of the Democratic Congressional Campaign Committee. "I think there's been an intentional strategy from the White House to do that to communities of color." Party organizers see potential in messages that emphasize bread-and-butter issues and community empowerment, but getting that to voters and registering new ones requires time, money and attention, all of which are in high demand to court other key voters. About 55 percent of Latino voters reported that they had not yet been contacted by a campaign or party about registering to vote this year, according to a Latino Decisions survey for the National Association of Latino Elected and Appointed Officials last week. Hispanic turnout traditionally lags behind other demographic groups, especially in midterm elections, where it dropped to a record low of 27 percent nationally in 2014, compared with 45 percent among whites, according to the Pew Research Center. And recent polls show Latinos less enthused about November than other minorities. The issue is compounded by the fact that the Latino voting population skews younger than the overall one. "Age by itself is the single biggest predictor of turnout and no other variable comes close," said Matt Barreto, co-founder of the polling firm Latino Decisions. "But overlaid on that, the reason young people don't vote is because they don't feel the system is responsive to them." Some Democrats worry this dynamic has created a dangerous cycle of futility: The party needs to engage millions of young Hispanic voters to win tomorrow, but pursuing them means less time spent on voters who are likely to show up and decide elections today. Castro said he talked with former President Barack Obama repeatedly over the years about turning Texas blue, but doing so would take a sustained investment from deep-pocketed donors over multiple election cycles. "It would take someone stepping out and dedicating a tremendous amount of resources," Castro said. O'Rourke told NBC News that he's had to defy political consultants and experts who encourage him to focus only on those voters who data show are most likely to turn out next month. "They say, 'There are so few days left, time and money is so precious, don't spend it on people who traditionally don't vote,'" O'Rourke said. "Our response to that is, I would't vote either if no one ever showed up to where I am, listened to me, included me in what they campaigned on and what they wanted to delivered on." But Democrats and activists worry that years of neglect may put a ceiling on O’Rourke's potential. "(Democrats) don't invest in grassroots organization, they don't invest in the year-round work that needs to happen after an election cycle," said Cristina Tzintzun Ramirez, the founder of Jolt, which is trying to organize young Latino voters in the state. "Beto's greatest hurdle is the lack of infrastructure that exists in the Latino community." Trump is not popular among Hispanic voters, but opposition to him is nowhere near as monolithic as it is with African-Americans. There are huge regional differences among Latinos that defy simple one-size-fits-all messaging: Democrats need to win Cuban and Puerto Rican voters in Florida and fourth-generation Mexican Americans in Colorado and children of recent immigrants in Texas. 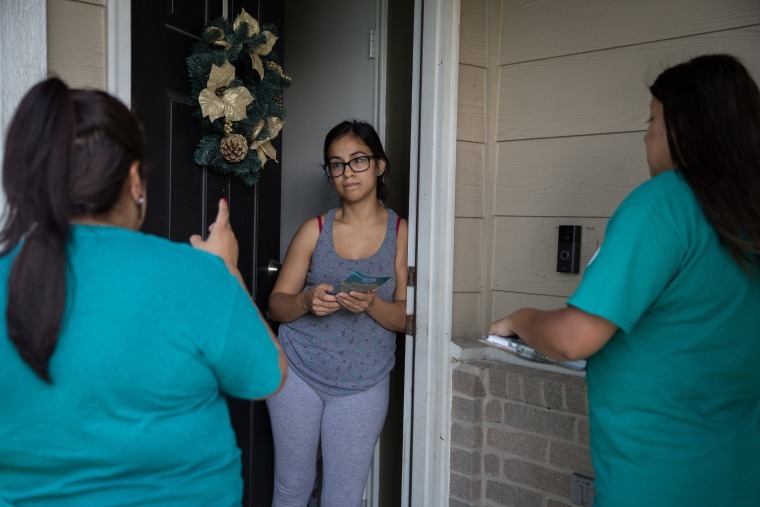 "Whatever is happening nationally, whatever the numbers for Republicans across the country with Latino voters, its always been better in Texas than other places," said Matt Mackowiak, a Republican strategist based in Austin. Past Republican candidates from George W. Bush to Sen. John Cornyn have won elections with strong performances among Latino voters. GOP Gov. Greg Abbott won 44 percent of Latinos in 2014 and might top that this year in his race against Lupe Valdez, a Latina Democrat and Army veteran. Among other factors, Mackowiak cited a conservative bent in many Texas Hispanic communities that makes it harder for Democrats, especially progressive ones like O'Rourke, to maximize their margins. "We're Hispanic, you'd think we would all vote against Trump, but some people in my family say he has some good ideas," said Alicia Rodriguez, a 20-year-old college student who came to an O'Rourke rally last week. "We're just not good voters"
Meanwhile, activists argue that the party has failed to cultivate many star politicians of Latino descent, making it more difficult for Democrats to communicate with the community. Of the many Democrats eyeing a potential presidential run in 2020, the only Latinos on most watchlists are Castro and Los Angeles Mayor Eric Garcetti, who identifies as "Mexican-American, Jewish-Italian." The DCCC tapped Rep. Ben Ray Luján, D-N.M., as its first Hispanic chairman this cycle and the Democratic National Committee is led by Tom Perez, who is of Dominican descent. The challenge for Democrats is particularly evident here in Houston, a sprawling metropolis whose surrounding county is home to the second largest Latino population in the county, trailing only Los Angeles. Yet Houston has never had a Latino mayor or member of Congress, even after a House district was redrawn expressly for that purpose. And none of the five members of the Harris County Commissioners Court is Latino. At the offices of the Texas Organizing Project, the promise of a "blue Texas" is still over the horizon. Some Democrats claim there would be more of them compared with the GOP in Texas if they all voted. But among regular voters, TOP estimates Republicans outnumber Democrats by 800,000. And they don't expect to close that gap until 2022. As canvassers gather to prepare for another day, the enormity of their battle comes into focus. In small teams, they fan out in all directions, some driving for 45 minutes just to reach maybe two dozen voters. Still, they say they are seeing signs of progress and claim credit for turning out 200,000 voters in Harris County in 2016, helping to change it from a place Obama won by just 971 votes to one Clinton dominated. In a tidy new subdivision in a far-flung corner of Houston, Miriam Perales greeted a canvasser one afternoon last week as her two sons played behind her. She voted in 2016, she says, but her husband didn't — something she's not going to let him get away with this year. "I told my husband, 'See, if you had voted, it might have been different,'" she said. CORRECTION: (Oct. 15, 2018, 11:22 a.m. ET): An earlier version of this article misstated the last name of an official with the Texas Organizing Project. She is Mary Moreno, not Morales.